Whilst being a British company means that our biggest market is our home market, we can and do send Cotic's all over the world. Most recently Anothony in LA bought a Rocket275 with some hand picked options via Tom and TrailFlo Bikes, one of our US dealers. Anthony sent us an ace email once he had got the bike up and running. Took the Rocket out for its first taste of dirt today... Shakedown ride, there wasn't much to shakedown as it was pretty dialed off the bat. Rocket 275 absolutely rips going down. The BOS suspension matches the Rocket really well, I'm glad that I am enduring the headaches of getting the small bits to get the shock running - its worth it. I've ridden a lot of bikes in my 15 yrs of riding and my favorite type of mtn bike is a steel full suspension. They're so solid and stay so planted on the downs, the Rocket definitely reminds me of my old Brooklyn Machine Works Racelink...silent and solid even as it ploughs through the rough stuff. The extra meaty tires made it more fun as well. Super happy with the bike, tell the boys at Cotic they've nailed it with this bike. After such a lovely email we replied and thanked him, and got yet more fantastic feedback. Glad to rep Cotic and your ethos. The carbon fiber wonderbikes of today are awesome in their own right. I know - I've just sold one to fund my rocket. That being said, some of us prefer the feel of steel- I've always loved steel bikes they are so SOLID on descents and the well designed ones are planted and silent as they rumble down singletrack - the Rocket has this in spades. I was genuinely surprised how I didnt really need to fiddle with much on the bike other than a few clicks of hardening up the front and rear suspension, not to mention it climbs pretty decently too! Take pride in knowing your newly designed Rocket not only thrives in the world famous British terrain and weather but also the US West Coast (loose, chunky, steep: granted some recent rains have livened up our trails and made them a little but more British with some mud and hero dirt). 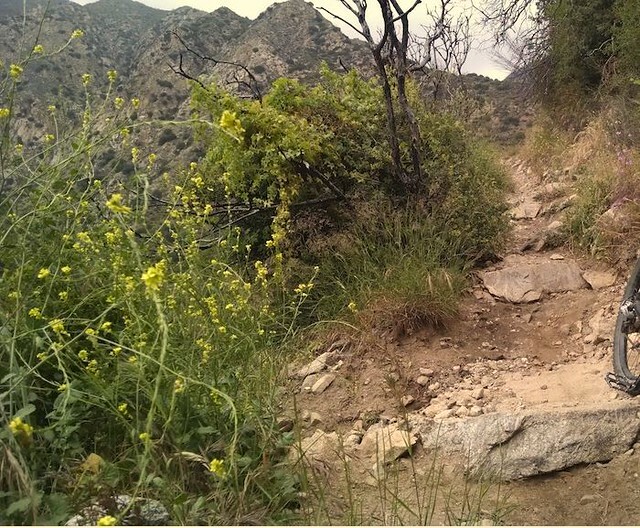 Attaching a picture of one of my local haunts (apologies for not picturing the Rocket but I was too busy ripping the dirt and flipping the rear tire around the switchbacks...) but to give you guys an idea of what your Angeleno Rocket is thrashing these days. Give me a shout if you guys ever make down here, I would gladly show you the trails that make Southern California riding so awesome. Monday morning emails like this are what makes this job one of the best. Thanks so much Anthony, and don't think we're not SORELY tempted by your offer of SoCal riding right now! !